Above: 1966 photo courtesy of The East Ridge History Center (Special Thanks to Bill Peterson who enlisted the mayor of East Ridge among others to discover the vintage HoJo's image and then secured permission for its use as well as the image seen below). Built in 1966, the East Ridge complex was a motorist's welcome station to the Volunteer State! It featured a classic design with 90 guest rooms situated in two-story guest buildings and included an on site beauty parlor. The Motor Lodge last flew the Howard Johnson's banner in 1987, and by that time its Restaurant had been torn down. Subsequently the Motor Lodge operated as Hospitality Inns of America. Above & Below: The thoroughly modern middle 1960s complex built in East Ridge, Tennessee welcomed travelers as they entered the Volunteer State from Georgia. 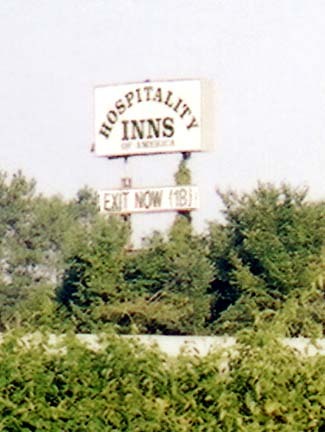 The site featured a classic highway style layout and its Restaurant was an early example of the once ubiquitous A-frame design which had been derived from the chain's ambitious "Concept '65" prototype. While well sited to capture the attention of motorists, the facility was was demolished by the early 2000s. Lower: By 2003 just an empty field and the site's recycled ghost sign remained.